Choose the stop motion software trusted by creative professionals. Stay focused on your animation with the new bluetooth keypad controller. Start your stop motion filmmaking journey today. We think the keypad is an essential part of using Dragonframe. However, it is possible to purchase Dragonframe 4 – Software Only. The premier image capture software for stop motion animation. We think the keypad controller is an essential part of using Dragonframe. You asked. We listened.Our new bluetooth keypad is wireless, shock resistant and super responsive. It provides the functions you need to animate, in the location you need them—anywhere on set. 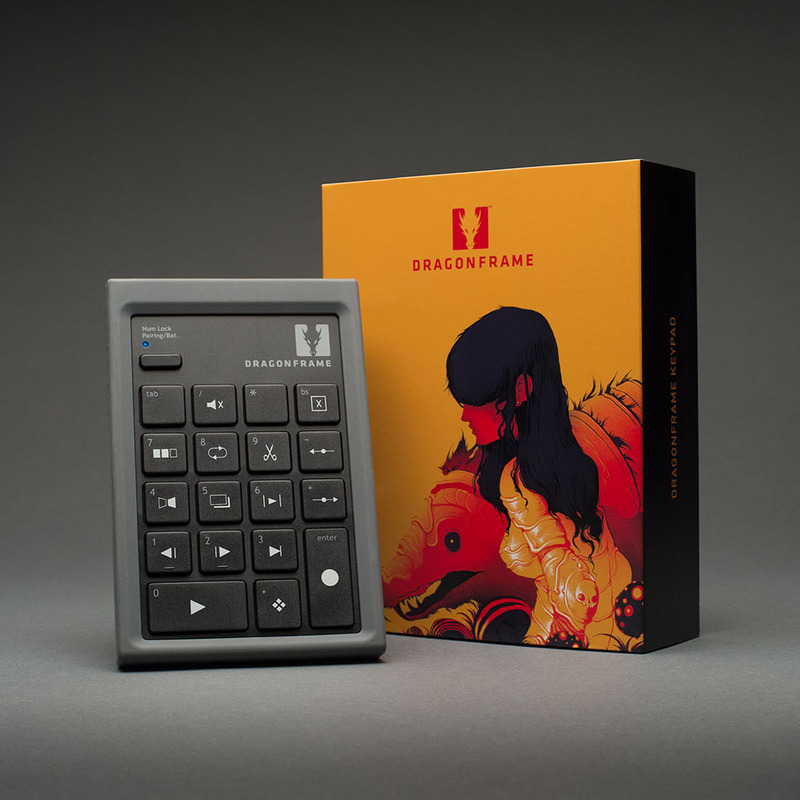 NOTE: We only sell keypads to Dragonframe license holders. Please provide your license in the checkout order notes. Dragonframe 4 stop frame animation software for macOS, Windows and Linux. You will receive a serial number within your e-mail invoice. Download the software from our site. Use this serial number to activate the software. WHAT THE LICENSE ENTITLES YOU TO: You may activate the software on one computer for every license you purchase. You may also activate a single license on a second computer if Dragonframe will not be used on both at the same time. You will receive free minor updates and bug-fix releases (e.g. 4.0.1, 4.0.2, 4.1.0, etc.). The end-user license agreement is part of the installation process. You can also review it here: EULA. Our new bluetooth keypad is wireless, shock resistant and super responsive. The most useful animation tools are available through the Dragonframe bluetooth keypad, allowing you to stay focused on animating instead of hunting around with the mouse. And the hotkeys are fully configurable, so if you really like a feature that is not on the keypad, you can move it there. Note: Requires Bluetooth capabilities in your computer. Most modern laptops have this. If your machine does not, you can get a bluetooth USB adapter. Rubber moulding to protect against drops. Locator nubs on the Stepping keys. Includes numbers for remote data entry with functions like Cut Back. Open System Preferences and go to Bluetooth. If it says “Bluetooth: Off”, press Turn Bluetooth On. Flip the power switch to ON. Press the CONN. button. You will need to use a pencil tip, paper clip, or something similar to press it. The keypad should appear in the Bluetooth Devices list. Select the keypad in the Devices list and press the Pair button. Enter the number shown on screen using the bluetooth keypad and hit enter. Your keypad should be paired and ready to use. Find the Bluetooth icon in the toolbar, right-click it, and choose Add a Bluetooth Device. This will open Manage Bluetooth Devices. The keypad should appear as “Bluetooth Keypad” in the Manage Bluetooth Devices list. Select the keypad and press the Pair button. You can find additional instructions and troubleshooting on our FAQ page.